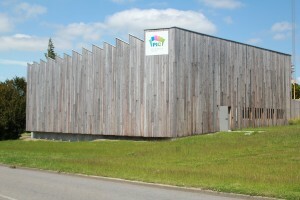 The Chemical Engineering Centre (PIC), a key element in welcoming business into the École Nationale Supérieure de Chimie in Rennes (ENSCR), plays its part in striving for excellence, innovation and industrial development in the region. The aim of this 565m² facility is to meet the demand from companies that want to set up locally to develop products or processes while benefiting from the high quality scientific and technological environment at the ENSCR. Built as an extension to the ENSCR research building, the PIC was designed to comply with environmental demands. The construction materials, the energy recycling in the laboratories and the position of the technical elements were all designed to make the building energy-efficient and easy to maintain. The ENSCR offers facilities to companies who do not have the necessary internal resources or want to externalise certain specific tasks. The offer to companies is also based on varied and highly effective material resources which include the spectroscopy of atomic emissions, optical spectroscopy (absorption, UV-visible reflection, fluorescence), chromatography, mass spectroscopy, NMR, UV and IR spectroscopy, thermal analyses (TGA, TDA, DSC), drop tensiometry, etc. For enquiries about the provision of premises, facilities or services, please contact the industrial relations department.